Material: A2, A2-70, 304, Grade 18-8 Stainless Steel that provides a corrosion resistant fastening solution. Utilizes a 13mm wrench for installation to quickly and easily fasten the bolt in place. 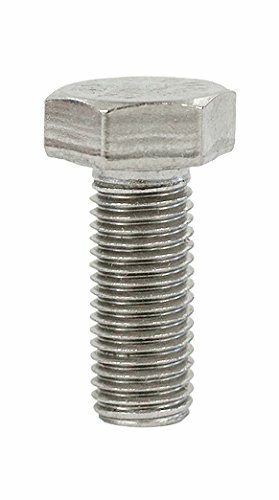 Package contains 5 pieces M8X1X20 full threaded hexagon head bolts made entirely from high tensile A2-70 Stainless Steel, providing excellent rust and corrosion resistance in wet environments. General purpose high quality hexagon fasteners with 20mm fully threaded length. Can be extensively used for interior applications: kitchen sinks, pipes, tabletops, stoves, refrigerators, light fixtures, furniture and other home appliances, office equipment, communication equipment, and even kitchenware such as pots and pans. Also great for exterior fastener locations: boating, jet-ski, bicycles, motorcycles, snowmobile, car body panels and bumpers, fenders, signage, biomedical, prosthetics, handles and fittings, access panels, cover plates and accessories. Can be used extensively in an assortment of industrial applications including architectural and engineering projects, model making, agriculture, and internal marine applications. Also for olympic and gym equipment, farm machine, solar and wind panels. Not ideal for external marine applications where the item or equipment is exposed to salt water. A4, A4-70, A4-80 or 316 stainless steel fasteners should be utilized for nautical environments. BelMetric has been in business for over 40 years providing customers with metric hardware & specialty automotive supplies. We offer an extensive variety of metric fasteners, metric nuts, metric bolts, Time-Sert kits and we stock hard-to-find items like castle nuts, stainless hardware, banjo bolts, brake lines, high-pressure clamps, and more. If you have any questions about this product by BelMetric, contact us by completing and submitting the form below. If you are looking for a specif part number, please include it with your message.